The earliest cotton mills in North Carolina, with a few exceptions, operated along rivers and streams in buildings that resembled gristmills or large residential structures. The Schenck-Warlick Mill in Lincoln County (1814), the first Holt factory on Alamance Creek (1837), and the Logan Manufacturing Company in Guilford County (1865) all occupied buildings that had served another manufacturing function. These mill buildings as well as those built to be cotton mills were usually of frame and sometimes log construction. Most were two-story with shingled, gabled roofs. Space just under the roof provided room for storage and for line shafting to run the production machinery. Flooring consisted of rough-lumber boards much like those found in a typical farmhouse of the period. Additions often were haphazard, architecture was stark, and fire walls between sections were rare until late in the century. The number of cotton mills in North Carolina remained small throughout most of the nineteenth century. In 1884 there were only 75 mills in operation. Within the next 20 years, more than 200 were constructed. The next great wave of mill building occurred during the World War I era, as the number rose from 293 in 1914 to 343 in 1921. During this period, most cotton mills shifted from steam and waterpower to electricity. The growth of the Duke Power Company in Charlotte contributed to this transition. In order to promote the use of electricity furnished by their power plants, James B. Duke and his brother Benjamin often financed the construction of new mills and became part owners of many others. They built the Piedmont & Northern Railway, an electric-powered line that extended for 150 miles through the textile region of North Carolina and South Carolina. The railway, completed in 1914, provided interurban passenger service and delivered freight to the numerous industrial facilities located along the line. The main effect of electricity on mill construction was to eliminate the line shafting and belt-driven machinery that often contributed to accidents and shut-downs whenever a problem occurred along the production line. A "better equipment campaign" in the 1920s led to rapid technological change inside most cotton mills. By the mid-1930s these plants were better integrated, requiring fewer interruptions and fewer intermittent processes. 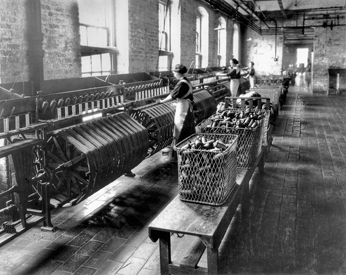 Most spinning and roving departments, for example, featured "long drafting" equipment that allowed production steps to be cut by half or a third. In the weaving process, the improved efficiency of looms increased production and allowed a single worker to operate more looms. Weaving machinery was faster, sturdier, and larger. Weave rooms featured better lighting and humidity control. Above all, the uniform speed of motors individually mounted on each set of looms offered consistent operation and minimal disruption. Further important improvement in cotton mills came after World War II. Survival in this highly competitive industry depended upon cutting costs and increasing production, and the major companies in North Carolina constantly reinvested in their mills and equipment. Burlington Industries, for example, embarked on a far-reaching $50 million campaign in the 1940s and 1950s to replace old equipment, enlarge plants, build new power plants, and install new lighting, flooring, and humidity-control systems. In the 1980s the effort to increase production through technological change continued. In 1984 alone, the industry spent $1.9 billion on new mill equipment ranging from accordion-armed robots, which automatically load and unload pallets of yarn and cotton, to high-speed weaving machines that replace shuttles with jets of water or air. By the early 2000s the National Cotton Council of America counted 386 textile mills, 47 gins, and 25 warehouses in North Carolina, employing more than 63,300 people in cottonrelated work. Boris Stern, "Mechanical Changes in the Cotton-Textile Industry, 1910 to 1936," Monthly Labor Review 45 (August 1937). [Flickr slideshow]. Hamrick, James Y. Eleventh Annual Report of the Bureau Of Labor Statistics of North Carolina. Raleigh, N. C: Guv V. Barnes, Printer to the Council of State. 1898. http://www.flickr.com/search/?w=14247749@N00&q=mills (accessed November 13, 2012). Reeling yarn at a cotton mill, ca. 1925. North Carolina Collection, University of North Carolina at Chapel Hill Library. 1 January 2006 | Glass, Brent D.